Red Deer Advocate, April 12h, 2012. 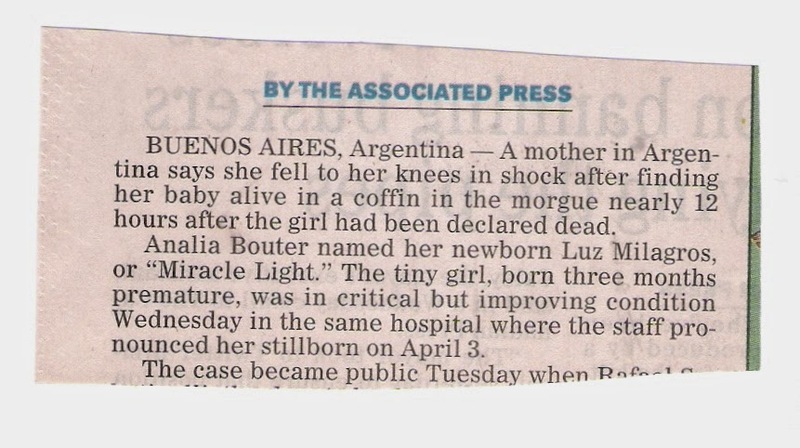 This Argentine baby was pronounced stillborn by mistake. The doctors in charge are guilty of the sin of negligence. The greater sin is to make a baby stillborn, which is done across Canada with regularity. Babies born at 6 months, or 24 weeks, gestation can survive. Yet, according to Statistics Canada, abortion is legal in this country throughout all nine months of pregnancy. Since 1988, there has been no law curbing abortion here at all. The only thing preventing more late-term abortions is the lack of doctors to perform them. But some doctors do perform them: 534 abortions were performed after 20 weeks gestation in 2005. Abortionmyths.ca: “Since the gestational age is reported by less than half of hospitals and clinics, the number of post-viability is likely doubled.” Margaret Somerville, ethicist at McGill: “It is known that at least 400 post-viability abortions take place in Canada each year and the actual number is probably more than twice that.” Abortions of 32 and 34 weeks gestation have been reported in Quebec. Late-term abortions are sometimes also partial-birth abortions, which is infanticide. Research at hospitals in London, Ontario, indicate that 72% of babies born at 24 weeks (6 months) gestation survive. Not surprisingly, therefore, a baby that is aborted at 22 weeks gestation looks like a fully developed infant. Go see for yourself, if you dare, at priestsforlife.org. Pro-abortion hard-liners claim that those of us who cry against late-term abortions would have abortions outlawed altogether. We would; those of us who have thought the issue through, that is. Is that not the humane law to press for, considering that a beating heart may be listened to by day 21 and brain waves can be detected by day 40? What do beating hearts and brain waves point to but life? Should life be terminated just because the bearer of it says so? Or should life be terminated just because it has been found, in the womb, to be imperfect? Would you like to be terminated because you have an imperfection? It would not take long for us to find one. A nation that slaughters its most vulnerable persons, yes, persons, will reap a harvest of hurt in return. Do you know how we are reaping? 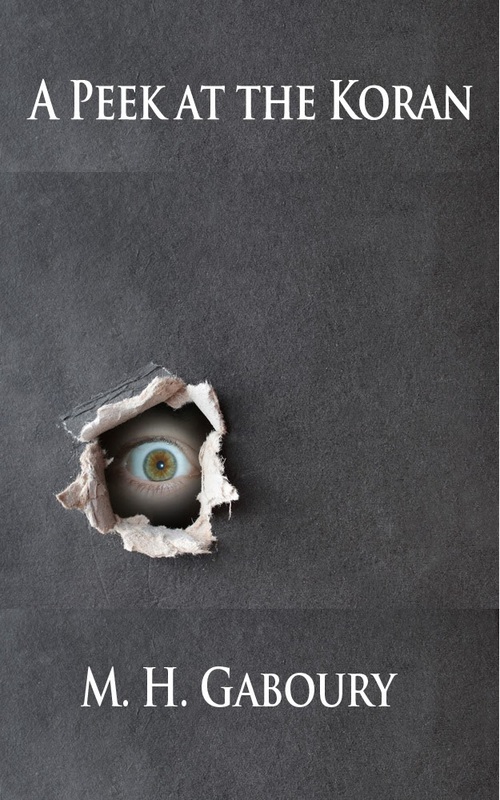 People who refuse to admit the obvious: that stopping a beating heart is murder, are the kind that God gives over to what the apostle calls a ‘reprobate mind.’ Read the final verses of Romans 1 to see what sins the reprobate mind ends up steeped in. The reprobate mind goes with a hardened heart; hearts that are hardened to a petrified state will not repent, will not be saved, will not take forgiveness, and will scoff at heaven and laugh at hell. Is that not what we see at the mall? downtown? in office cubicles? in schools? in colleges? in universities? on the rigs? in churches? Take a look around you and then consider your soul. Are you a reprobate like that? Does the beating heart in a womb convince you of life? Do you think that a person not convinced of that may be chosen by God to inherit life eternal? Would that not be a contradictory association? Pro-life is not the gospel, but unlike pro-abortion, it is consistent with it. The gospel yields life; pro-life preserves it. Jesus gave his life on the cross in order to save sinners from the penalty of hell and to grant them life everlasting. That is the gospel. Anybody believing that gospel and embracing it for his own eternal good will be on the side of defenseless life, maybe even to the point of wanting ‘life for life, tooth for tooth’ legalized in its honor. Abortion should be made illegal; and those who kill infants in the womb ought to have their own lives taken away by the State. That is how far this issue needs to go in order to prevent the blood of babes from being spilled. That blood cries up into God’s ears, count on it. And there will be literal hell to pay by persons who refuse to listen to what God hears. Murdered babes will have their day! Politicians beware! Abortionists be afraid! Killers of babes watch out! Apathetic souls wait for it! God will get you yet! His ears are open to the blood of babes! Unless you repent, not only of being on the side of that idol called ‘choice,’ but of all your ungodly sins and misdeeds, God will not hear your pleas for mercy on Judgment Day. The blood of babes will then be something you will answer to. The babes are heard by God as their blood spills out on our hospital beds; they will be heard by all of us eventually.